I wrote at some length about legal aid, tenants rights and Grenfell Tower here (the third of the ‘myths’). Sara Stephens (my esteemed colleague – full disclosure) also explained the situation in a Legal Voice article here. But still it rumbles on, including from two people who really should know better, as quoted in this Guardian article. No, Robert, no. There are plenty of examples of people being unable to access legal aid for things that they used to be able to get it for in housing issues – transfers, allocations, dealing with housing benefit, damages claims for disrepair – but the matters that the Grenfell residents were seeking to raise and seeking legal help for were not covered by legal aid because there was no legal mechanism to do so. They were told they could not get legal aid, I strongly suspect, because there was nothing that a solicitor could do at that point. Mr Bourns is wrong, but I think we can probably chalk it up to him or his PR person getting over-excited and over-egging it. Inaccurate and tasteless, perhaps, but not a venal sin. “Under the legal aid arrangements, if you are a tenant and have concerns about safety issues, you can get legal aid to take action against your landlord. The Lord Chancellor, of course has an entire Ministry beneath him, some of whom might be expected to know stuff. And apparently also has the LAA looking things up for him. So it is rather more surprising that he should get this so badly wrong – and in such a way as would amount to something of a smear on Grenfell tenants. Let’s take this step by step. 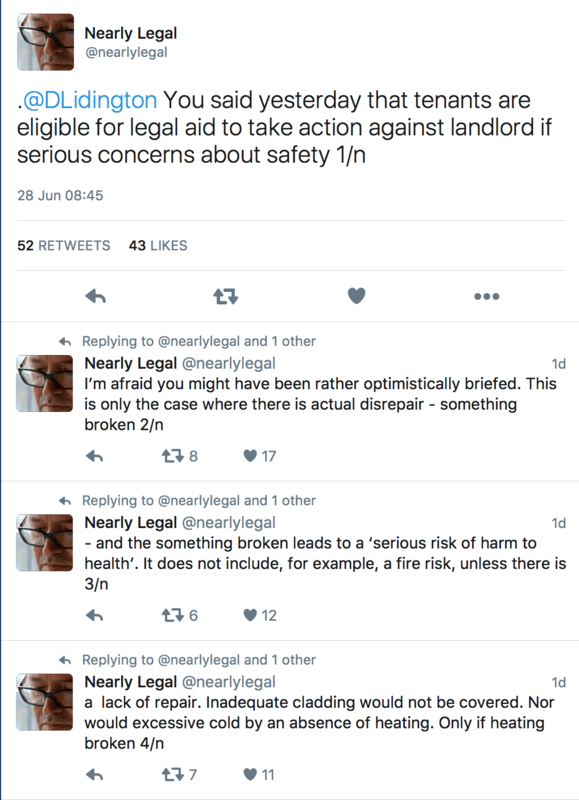 Legal aid is only available for disrepair, and where there is a ‘serious risk of harm to health’. For disrepair, something has to be out of repair. For many, or indeed most, ‘safety issues’, nothing is out of repair. It might not be up to standard, or a material that creates a risk, or an inadequate heating installation, or an inadequate fire escape route. It might be cladding that creates a fire risk. Or gas pipes not adequately contained. None of this is disrepair unless something is actually broken. 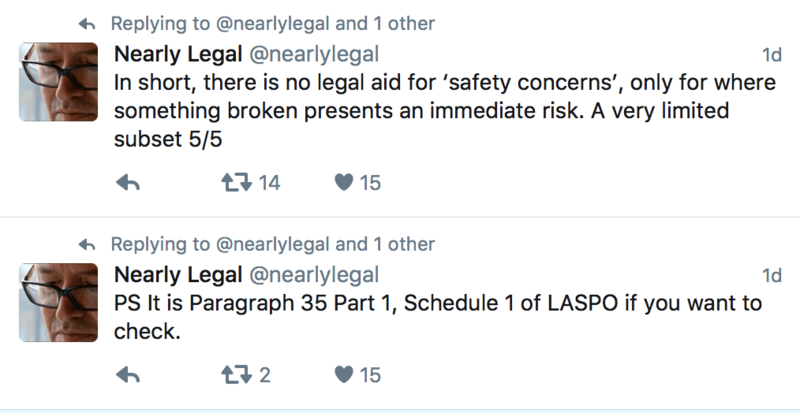 So, legal aid is not available for ‘safety concerns’. It is only available where there is an immediate risk to health due to something being broken, or not working as it was designed to work. The MoJ know this. The LAA know this. Nonetheless, the Lord Chancellor was briefed otherwise and has trotted out what is pretty much a falsehood. And then why go on about the LAA having checked for any applications by Grenfell residents? They wouldn’t apply anyway, a solicitor would. And the solicitor would only if there was a matter for which legal aid would be granted. Which, as we have seen, there wasn’t. 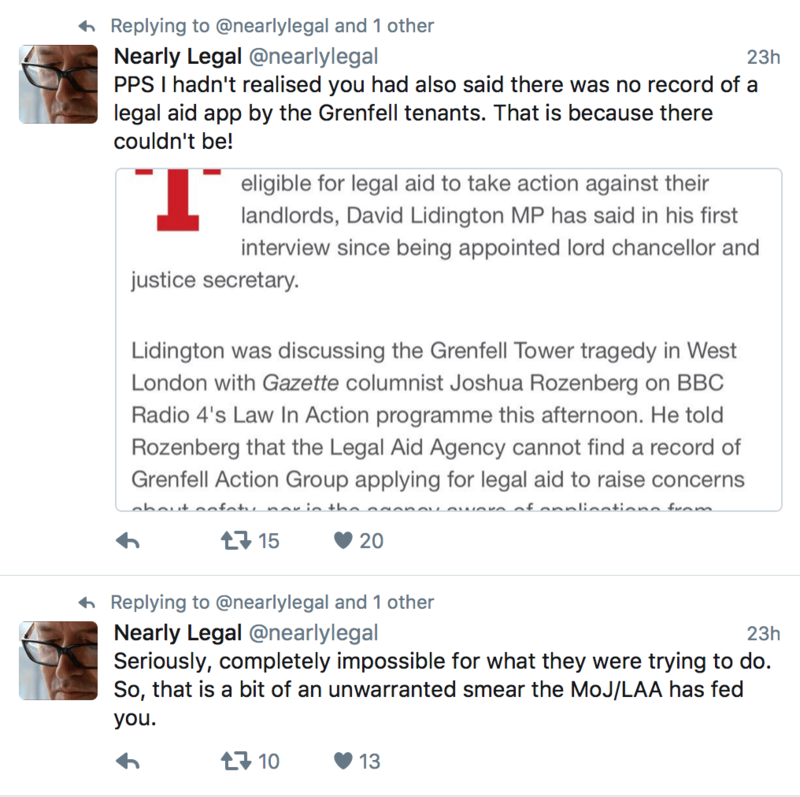 The Grenfell residents didn’t say they had been refused legal aid, they said they couldn’t get it. Which indeed they couldn’t. The Lord Chancellor giving voice to the LAA’s weasel worded arse-covering – an attempt to portray the residents as liars – was deeply disappointing attack politics. I attempted, politely, to explain some of this to the Lord Chancellor on twitter. But I guess he isn’t checking his @s as I haven’t had a thank you. Posted in Disrepair, Housing law - All and tagged fire safety, Legal Aid. Despite all the “knowledge and information” available to the Lord Chancellor, he has made a statement which completely misrepresents the victims of the Grenfell Tower, and he also appears to have attempted to unilaterally amend LASPO. A completely incompetent and misleading political statement. It’s incredibly frustrating. I’ve seen more “misinformation” peddled as fact in housing over the past month than ever before. It really made me wonder about the politicians and national media and how easily they pass off their false notions as facts. It is extremely worrying. If they can mess this kind of detail up, what else are they getting completely wrong?